We’ve completed a re-discovery of the Performance Platform. This is the first in a series of posts in which we’ll explain why this was necessary, what we’ve learnt and what we’re planning for the future. This year you will see some changes to the Performance Platform. We spent the last few months of 2015 completing a re-discovery and it’s now time to act on those findings. This means a refocused approach and product - which will help us meet the user needs we identified in discovery. We believe that making things open makes them better, so in a series of blog posts we’re going to share what we’ve learnt during that discovery, what’s next for understanding how well government services are performing and what this means for the performance platform. Services will need to continue reporting the mandated 4 KPIs as required in the Digital Service Standard, so if you work on a service and need a Performance Platform dashboard, please get in touch. Back in 2010, Baroness Lane Fox’s report called on government to ‘fix transactions’. To do this we needed to understand the scale of the problem and one of the biggest challenges was having a clear idea of what was happening across government as a whole. Our starting point to do this was the Transactions Explorer - we used it to collate volumes, cost per transaction and digital takeup. For the first time, this government data was publicly available in one place, which was pretty bold. From there, we embedded the ideas into the Service Standard, and made the measurement and publication of four KPIs mandatory for all services. 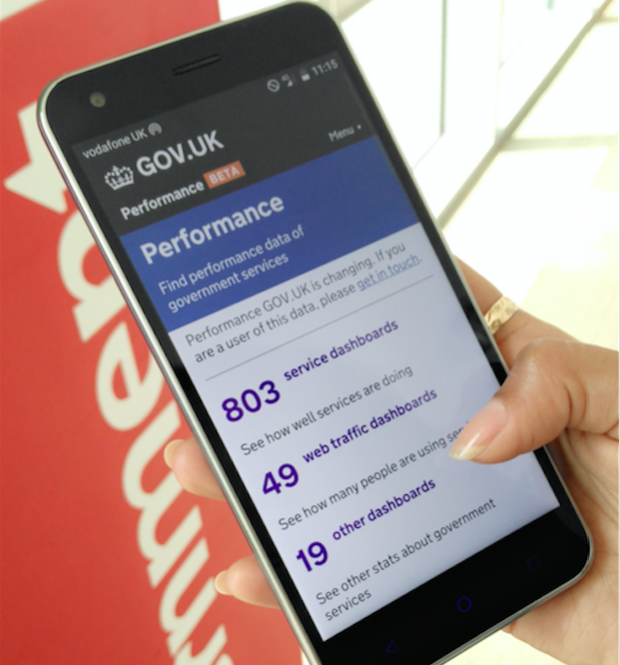 The Transactions Explorer evolved into the Performance Platform and in quite a short space of time, openly available performance data became part of the status quo, just like the Service Standard and GOV.UK. It’s easy to forget how dramatic the change has been but with our colleagues in departments and agencies, we’ve been pursuing an ambitious, world-leading vision that has changed our expectations about public services. With some new team members in place we had lots of questions - we wanted to know what problems people were trying to solve with data, we wanted to know if we were continuing to meet users’ needs and, if not, we wanted to know what we should do about it. These were the sorts of questions we couldn’t answer through research on the existing product. This wasn’t about iteration, it was time to go back to discovery. What are people’s needs for data to understand and improve performance? In 5 weeks, we visited 14 organisations and spoke to 55 people doing various roles. We used a framework based on Lev Vygotsky’s activity theory to analyse the individuals and built personas, representing clusters of people who exhibit similar motivations and behaviour patterns. If you’re interested in how to use Activity Theory to build personas, we will be writing a blog post about it soon. In our next post, we’ll talk about what we found in discovery and the next steps we identified. Subscribe to this blog to receive the latest updates.